Ta-dah! Roast chicken! 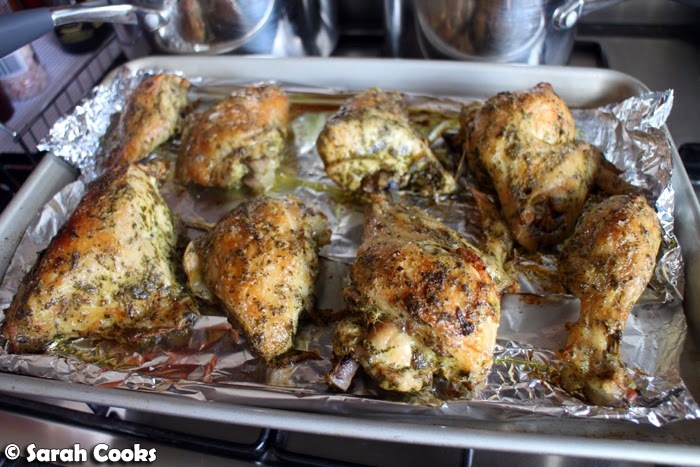 I made this herbaceous, mustardy roast chicken for a lunch party back in January. It's very easy (5 minutes prep time, then the oven does all the work) and super tasty - perfect for entertaining. Or just regular dinner! So, the marinade recipe comes from Donna Hay. 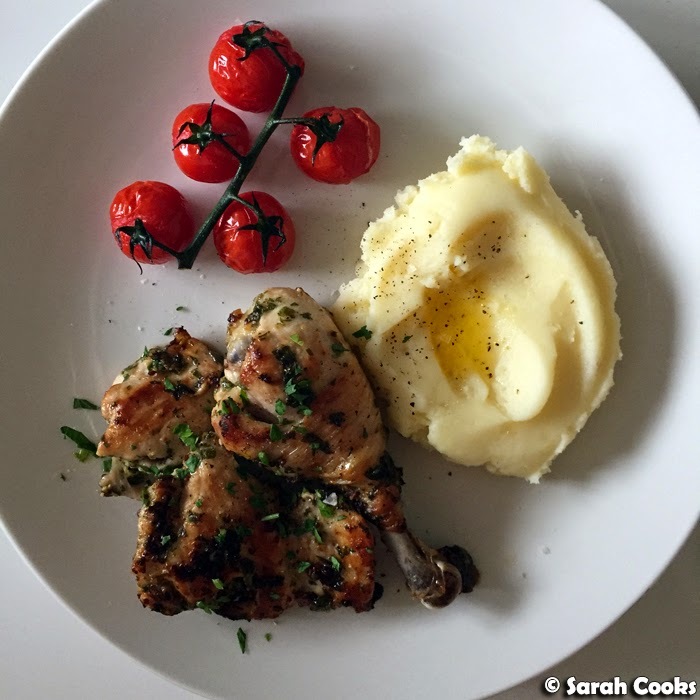 I came across her recipe for herby mustard chicken with olive oil mash when searching for a weeknight dinner, and totally loved the flavour combination. (Obviously I made my mashed potatoes with butter instead of olive oil - delicious). The only problem I had with the recipe was that it took ages to fry up all the chicken pieces, and it was quite messy, splattery work. So when it came time to cook for my lunch party, I wanted something with the same flavours but that would be easier to prepare. I used the same marinade, but slow roasted the chicken in the oven, using the same method as Nigella's St. Tropez chicken (recipe in Feast). Boom boom. 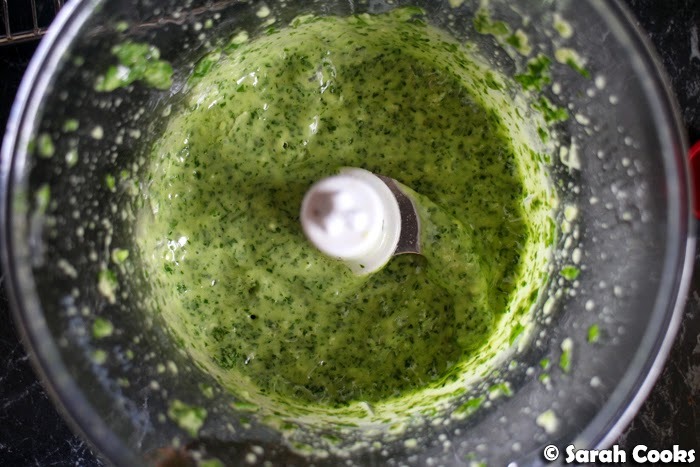 Here's the marinade - parsley, rosemary, garlic, Dijon mustard, white wine vinegar, olive oil. It's really fragrant, and the vinegar helps to tenderise the chicken. 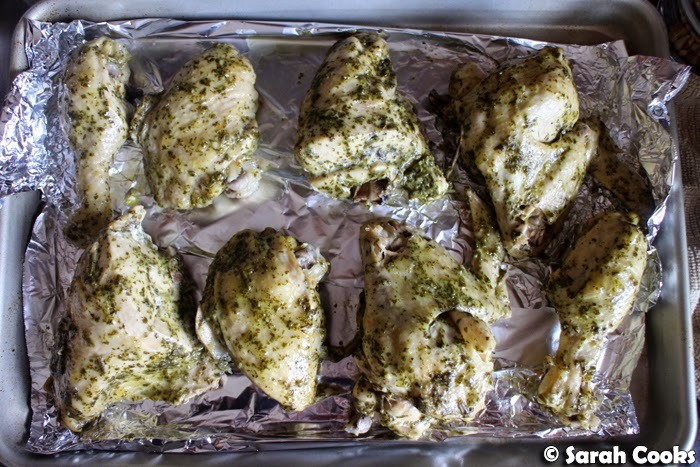 Basically, you cover the chicken in the marinade, cover the tray in foil and roast it at 170C for two hours. (Breasts cook faster than legs, so if you're super keen I guess you could take the breasts out after one and a half hours, but I left all of them in there for the whole time and didn't find the breasts dry). Once that's done, you blast the chicken pieces in a hot oven until crispy. I removed the pieces to a separate tray before browning, to help the crispening process. That's it! 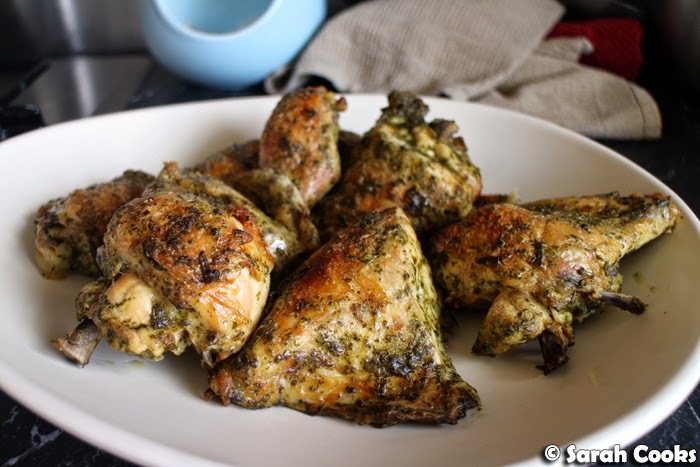 Crispy skin, tender meat, heaps of herby flavour. Yum yum yum. Enjoy! Place all the ingredients (except the chicken!) into a food processor or blender, and whizz to combine. (If you don't have a food processor, you can chop the parsley and rosemary, crush the garlic, and stir everything together). 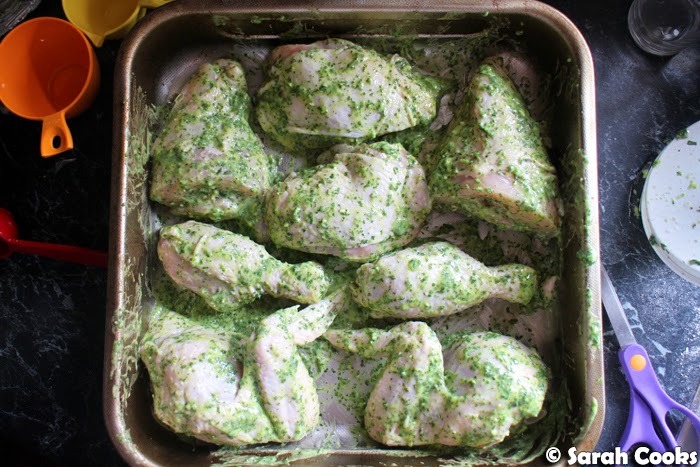 Pour the mixture over the chicken pieces in a large baking tray, and (preferably wearing food gloves!) smoosh it all over the chicken. Season with salt and pepper. Cover the tray with foil, and roast for two hours. 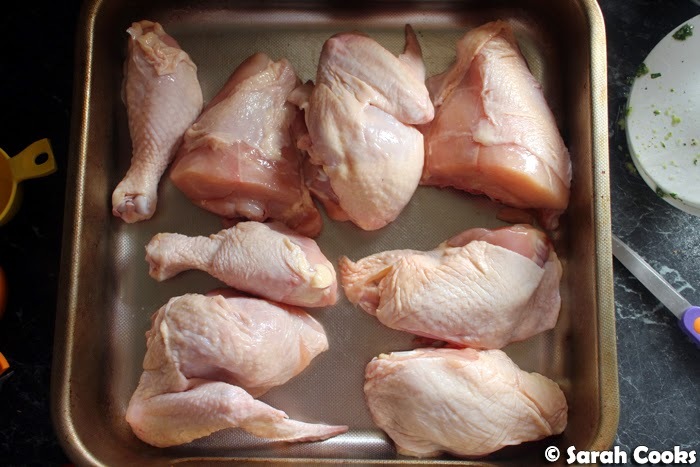 Remove the foil, and if there is a lot of liquid, transfer the chicken pieces to a fresh tray. Too much liquid will prevent the chicken pieces from browning and crisping up. (If you like, you can serve the pan juices in a little jug as a sauce). Sprinkle the pieces with a little salt. 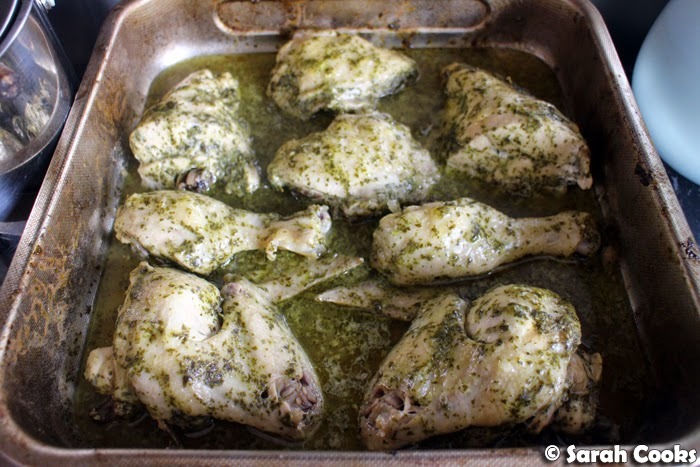 Increase the oven to 220C, and place the chicken back in the oven. Cook for 10-20 minutes, or until golden brown and crisp. Serves 4-6, depending on what you serve with it. Yum would never have thought that chicken pieces roasted for over two hours would still be juicy. The marinade sounds delish! Looks so homey and comforting. Yum! Sarah, this chicken looks amazing! I love how you combined the herbs and used mustard. The flavors are just perfectly combined!